Home » Grading programs for Aikido exams. 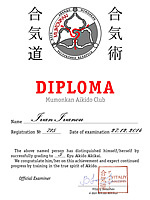 This page lists certification programs for Aikido exams for student level (Kyu) at Mumonkan Aikido Club. The programs are based on the requirements of the World Centre of Aikido Aikikai Hombu Dojo. 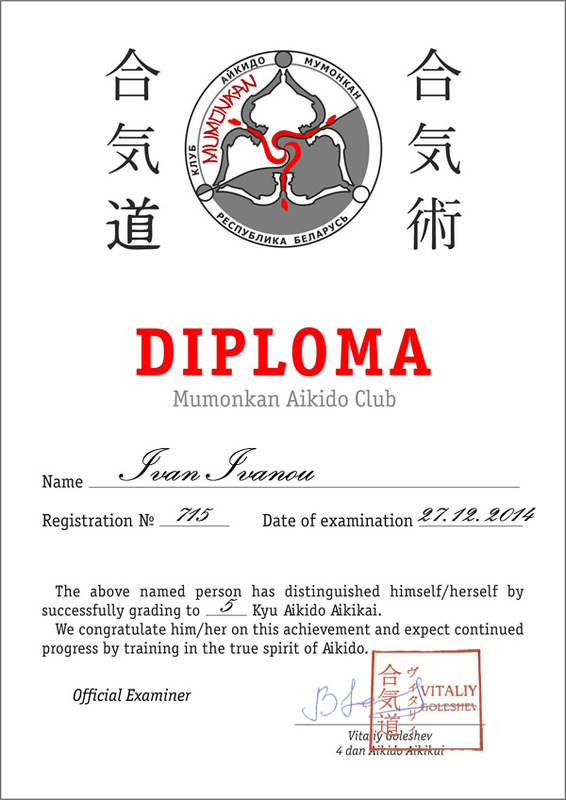 However, the Mumonkan Aikido Club examination program is much broader and includes a number of additional requirements that are not in the Hombu Dojo grading examination system. Therefore, if you attend some other Aikido school, our programs are not likely to suit you. 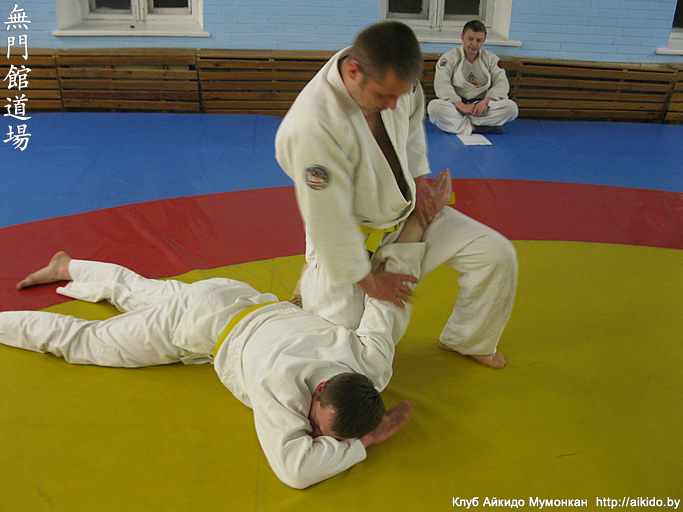 Download the aikido exam program for 6 Kyu /yellow belt/ (in Russian). 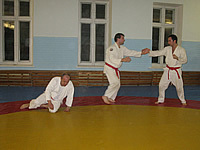 Download the aikido exam program for 5 Kyu /red belt/ (in Russian). Download the aikido exam program for 4 Kyu /green belt/ (in Russian). Download the aikido exam program for 3 Kyu /navy belt/ (in Russian). Download the aikido exam program for 2 Kyu /purple belt/ (in Russian). Download the aikido exam program for 1 Kyu /brown belt/ (in Russian). It is inappropriate to ask for an exam. The instructor is closely monitoring all students during the lessons, and he/she will offer you to take an exam when he/she sees that you meet the qualification requirements. Examination in Aikido is a voluntary matter. You can opt out of the exam. There is certain time frame between the degrees in Aikido, i.e. you cannot take two exams, for example, for the 5th kyu and for the 6th, on the same day. There is a preliminary test before the examination when the instructor watches the applicants fulfilling the program requirements, makes comments, corrects errors, and gives advice. Generally, a group of people split into pairs to take an Aikido exam. You and your partner decide who will be the first in your pair to perform a technique. or you will take the exam as a triple team. The one who performs a technique is called a tori, while that who assists is a uke. Please note that during the exam not only the Tori's actions, but also the correct behavior of the uke are evaluated, as the uke is obliged to create the conditions necessary for a particular maneuver. During the exam, the instructor names only an attack type and a technique you are to demonstrate. Instructor's hints are not allowed. The uke attacks with his/her right hand first and then with his/her left one. If you take the exam in threes as well as when performing jui-waza (randori), one of the uke attacks with his/her right hand, and the other one with his/her left hand. If the Aikido technique supposes an alternative (omote and ura), so the tori shows the omote variant first, and then the variant of ura. Any technique must be performed for as long as you are not given a command to stop or reverse the roles. After you pass the examination, you will be granted a certificate indicating the degree awarded. If you are a member of the Belarusian Aikido Federation, the degree assigned to you will be recorded in your Budo-passport. Before the exam, please pay attention to your appearance. You should look neat; your kimono must be clean and, if necessary, ironed. Want to join us? First lesson is free! Choose dojo and welcome. Contacts Mumonkan Aikido Club instructors.